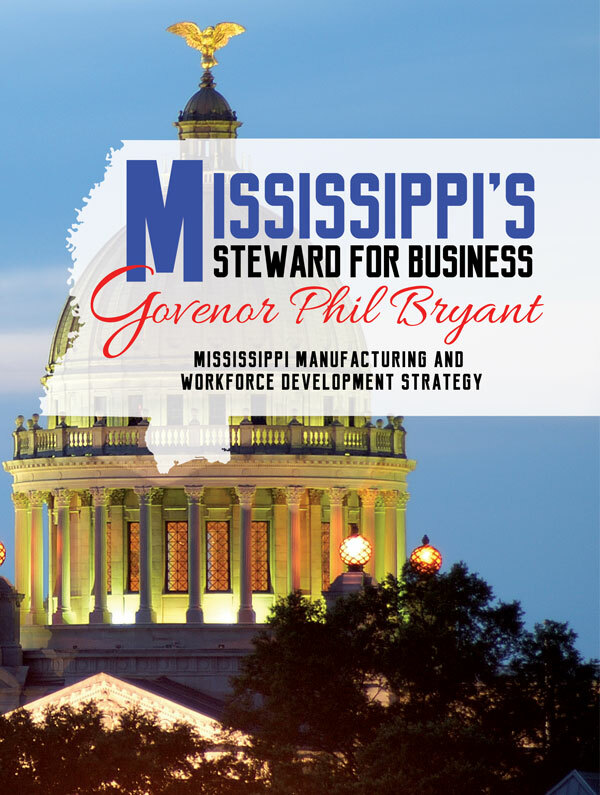 Governor Phil Bryant, Mississippi’s 64th governor, is a known champion for the state’s manufacturing industry. Mississippi is a leader in growth in gross manufactured exports, which rose 259% from 2004 to 2014. Total exports have risen 380% in the last ten years. The governor explains Mississippi’s growth in manufacturing as intentional and part of a long-term plan. To facilitate that plan, Mississippi will need qualified people to fill jobs. That is also part of the plan, says Mississippi’s governor. Mississippi’s central southern location, easy access to sea, land, and air transportation, and pro-manufacturing tax incentives attract the attention of manufacturers. However, without a qualified workforce, a manufacturing company will suffer or fail. The workforce is what secures business long term, and encourages growth at Mississippi locations. Workforce is always critical to any manufacturing operation. Says Governor Bryant, “Where workforce is concerned, you have to plan the biggest changes at least ten years ahead.” The governor points out, “We are raising our next workforce. Mid-level jobs are jobs that do not necessarily require a four-year degree. Mid-level education is typically a high school education coupled with some college-level courses, such as courses at a community college, or specialized training. Mid-level job opportunities range from welding to robotics. Manufacturers seek candidates in the mid-level, who have basic knowledge sets, normally including science, technology, engineering, math, and reading comprehension. In some cases, vocational training and certification is also desired or required. When job candidates do not have the proper training or education, remedial education and training programs have to be utilized to bring workers up to speed. Remedial work takes time, resources, and money. A workforce requiring remedial education is at a disadvantage. The goal in Mississippi is to prepare candidates before they hit the workforce, beginning at kindergarten. This strategy is designed to significantly bolster the quality of Mississippi’s workforce over time as those students graduate from high school and community colleges and take on careers. The state is backing the premise that if children are able to learn to read, they will go on to read to learn. An individual’s academic career is highly influenced at an early age. The state of Mississippi has targeted a younger academic population and established a Third Grade Gate in the school systems. The Third Grade Gate dictates that no child passes the third grade who is not reading at a third grade level or higher. The Third Grade Gate is meant to prevent a trend of decline that occurs when students are socially passed through this pivotal point in their academic career. The reading skills a student develops by the end of the third grade are critical in developing a foundation for academic development and achievement in successive grades. Beginning in 2012, funding was established to place reading coaches in schools. The result of this $35.9 million investment is a significant increase in reading performance in the third grade. According to the governor’s office, the percentage of third-grade-level readers in the third grade is 91% as of August 2015. The level of reading improvement is expected to influence the students’ academic careers, future job prospects, and ultimately the quality of workforce as these third graders seek jobs in 10 years. Mississippi manufacturing companies have partnered with local colleges to implement curriculums specifically for their industries. The companies offer financial support, equipment and resources, strategic collaboration on curriculum design, and even personnel to assist with instruction. The programs range from highly specialized certification programs spanning weeks, to integrated two-year degree programs. This directed approach to education ensures participating manufacturing companies have workforce-ready job candidates upon graduation, and that graduates have concrete opportunities to earn a decent, family-friendly income and enjoy a higher quality of life. The governor’s office reports that, in the 12 months from October 2014 to October 2015, the labor force has risen 57,400 from 1.221 million to 1.278 million, and the employed rate has risen 71,000 from 1.132 million to 1.203 million. One significant advantage Mississippi has as a state is the character of its workforce. Mississippians have earned a reputation for appreciating life and livelihood. The strength of character in Mississippi workers in the manufacturing community is something that regularly draws positive remarks by company leadership. It is also a huge advantage in building the mid-level workforce. Mississippi is a state that has historically experienced significant success in the industry of manufacturing. That success continues today. Currently, manufacturing accounts for as many as 12% of jobs in Mississippi, and as many as one-third of the jobs in Mississippi are related to manufacturing. Manufacturing not only drives the Mississippi economy, it is the lifeblood for a significant number of Mississippi families. Every manufacturing company and every manufacturing job that is brought into the state represents more than just another income. It is a step forward for the citizens of Mississippi, their families, and their community. Manufacturing is a cornerstone in the quality of life for families across the state. Governmental support for an industry this vital just makes sense. Well-planned legislation and strong leadership at the state level send a message to manufacturers seeking new locations for operations, as well as to those who have already found home in the Magnolia State. The governor has appointed Executive Director of the Mississippi Manufacturers Association Jay Moon as the Chairman of the State Workforce Development Board. Among other duties, Moon will be responsible for developing a comprehensive workforce development plan. The job base in Mississippi has grown overall, with an emphasis on manufacturing. Even as manufacturing processes become more automated, Mississippi’s manufacturers continue to add to and expand operations, creating even more jobs. For a state so heavily invested in the manufacturing industry, growth in that industry trickles out to the entire economy. Mississippi’s manufacturing is not only growing, it is evolving along with the demand for higher technology products, from advanced automobiles to unmanned aircraft. Many of today’s Mississippi manufacturers are in the high technology sector. Two examples are Stion and Raytheon. In Hattiesburg, Stion, named as a Red Herring Top 100 North America Tech Startup in 2011, manufactures high-efficiency thin-film solar panels. Stion solar panels have been selected for use by three new Mississippi solar farms, to be located in Jackson, Senatobia, and Brookhaven, as part of Entergy’s $4.5 million Bright Future Plan. In Forest, Raytheon, a manufacturer of the most advanced radar systems in the world, has expanded again and will be outfitting the new Lockheed Martin F-35 Lightning II fighter aircraft, a single-seat, single-engine, all-weather stealth, multi-role fighter that is undergoing final development and testing by the United States military. Sustained growth is the expected outcome based on well-laid plans. Mississippi has created an environment that is manufacturing-friendly and is currently executing plans for long-term growth. Mississippi is a state where manufacturers are expanding operations and where new manufacturers are entering the state. The focus on mid-level workforce development is critical in enabling manufacturers of today and tomorrow to be successful. Workforce development fuels a manufacturing economy. Strategically, it means Mississippi is right where it needs to be and is taking the steps necessary to secure its future in manufacturing.